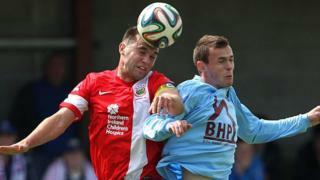 Linfield are shocked as Institute grab a late equaliser to earn a point in the Irish Premiership game at Drumahoe. The Blues squandered a number of goal-scoring opportunities before Ivan Sproule gave them the lead. Paddy McLaughlin rose highest to head home the leveller with four minutes remaining.